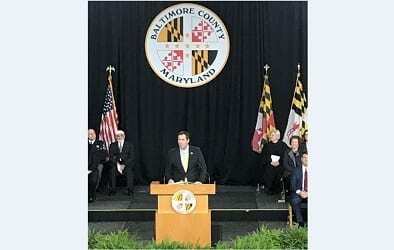 John Olszewski, Jr. was sworn in on Monday as Baltimore County’s fourteenth County Executive, vowing to create a more modern, transparent and open government. More than one thousand invited guests, elected officials, county employees, and members of the public celebrated the inauguration of local government officials in the executive, legislative and judicial branches. The inaugural ceremonies took place at Towson University’s SECU Arena at 10 a.m. on Monday morning with Administrative Judge Kathleen Gallogly Cox administering the oath of office to Clerk of the Court Julie Ensor, who then administered oaths of office to the other elected officials – including Judges of the Circuit Court Carey Deeley, Michael Finifter, Ruth Jakubowski, and Dennis Robinson; Judges of the Orphans Court William Evans, Juliet Fisher and Arthur Frank; Sheriff R. Jay Fisher; Register of Wills Grace Connolly; members of the Board of Education Kathleen S. Causey, Roger B. Hayden, Julie C. Henn, Moalie S. Jose, Russell T. Kuehn, Lisa A. Mack, Rod McMillion, John H. Offerman Jr., Cheryl E. Pasteur, Lily P. Rowe and Makeda Scott; and the members of the County Council. “Good morning, everyone. Thank you to Dr. Schatzel and Towson University for hosting today’s ceremonies. Thank you, County Executive Mohler for your kind words. Thank you for your leadership: stepping into unknown circumstances and leading with your heart. Not only being the steady hand our county needed, but a leader who pushed us forward in the right direction who has left your own very positive mark on county government. 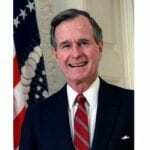 You rose to the occasion, led with dignity and always put the people of Baltimore County first. I met my wife right up the road at Goucher College about 15 years ago — Marisa, thank you for joining me on this journey and for all of the ways that you challenge me to be a better husband, father, and person. I am better equipped to handle this job because, as always, I have you standing alongside me. To my curious, creative and adventurous daughter, Daria: I love both you and your mother so much. Thank you for being such a source of inspiration since the day you arrived. Thank you for reminding me what an incredible obligation I have to boys and girls just like you. I would also like to thank the many members of my immediate and extended families, especially those here with us today, for your unconditional love and support. Finally, and most of all, I want to thank the people of Baltimore County for this incredible opportunity. Over the past several years, we have engaged in a conversation about what’s possible; recognizing that every community has its own strengths and its own unique set of challenges, but knowing deep down we all want and deserve the same things: great schools, equitable investments, an economy that works for all of us, and a government that is open and connected. The enormity of making the possible real begins today — and the responsibilities ahead are not lost on me. I am grateful that you are all here as we start this journey to celebrate Baltimore County’s future, and I am honored to be your Baltimore County Executive. As we begin the next chapter in Baltimore County’s story, we cannot forget the void that was left when County Executive Kevin Kamenetz was taken from us far too soon. Thanks to the remarkable strength and grace of Jill, Karson and Dylan, Kevin’s spirit lives on. Today I proudly wear a pin of Kevin’s that was given to me by Jill, honoring his legacy of service. I would like to also acknowledge the Councilmembers, Judges, Board of Education members, and everyone else here on stage with me today, and to congratulate each of you. We may represent different branches of government and areas of responsibility, but how fitting that we are all sworn in together? Fitting because we’re all on the same team and because the challenges we face must be tackled by each and every one of us working collectively and in partnership. Together, we will never put partisanship, or pride, ahead of progress for our people. I come to this place with all of you from the shadow of our county’s former steel mill. To me, all I have ever experienced of Baltimore County is that it’s a place of incredible opportunity. I was a first generation college student, who went on to earn my Ph.D. — all here in our great county. But I know for countless others, that same potential wasn’t realized. For as much opportunity as I was provided, I also witnessed decades of decline in my neighborhood as key industries shuttered their doors. I want everyone to know the opportunity I have had. It is why I came back to my hometown to become a public school teacher and why I ran for office to represent my hometown in the state legislature, where we started reversing the decline we once saw. A few years ago, becoming a father put things into an even clearer focus. Parenthood not only reminded me that the actions we take today — and those that we don’t — set the life course for every child in Baltimore County. It taught me that we can’t wait to take those actions. I knew I could not sit on the sidelines, and so we began our improbable journey. Driven by grassroots support, a clear vision for the future, and an enduring faith in one another, we accomplished what few thought possible. Now we have an opportunity to fundamentally change the course of our communities. What we can build is limited only by our imagination and our ability to come together to get it done. That starts with education. I am proud to stand here as the first teacher elected to this office. My years in the classroom will always drive my decisions. In everything we do, we will ask, “What is best for our families?” It is time to invest more — and more thoughtfully — in our people and our infrastructure. Decades of research have shown that the benefits of early education are clear, and that empowering more of our students to graduate from our community college system will grow our middle class. So we will find ways to expand access to Pre-K and community college, removing barriers to education so that we are also removing barriers to opportunity. We will also take on the challenge of rebuilding Baltimore County’s aging schools. We know that we cannot do this alone. I would like to acknowledge my friends and colleagues from Annapolis here with us today. Thank you all for your friendship and your partnership. I look forward to building a coalition with you to ensure Baltimore County has the support we need. I am eager to lead the charge for our communities, working with all of you to fight for what our communities deserve — in education and beyond. Every family in Baltimore County deserves the opportunity to achieve economic stability and security. A robust and dynamic education system is the foundation to that stability, but it’s only the beginning. We can and will embrace our strengths, leverage our anchor institutions and job centers, and fight to create the kinds of opportunities that attract and retain local talent. We will do it by facing our challenges head-on. Nearly two decades ago, we celebrated the arrival of a GM plant whose closure now threatens hundreds of our families. In Baltimore County, we to rise to these challenges. When the steel mills closed, our communities didn’t give up; we went to work. Today that community is in the midst of a transformative resurgence. It wasn’t easy — but we took that challenge on together. We relied on the resiliency of our people, and we looked to the future, addressing 21st-century challenges with 21st-century solutions. Those 21st-century solutions include partnership with our neighbors across the Baltimore region, because jurisdictional lines are just that: lines on a map. We rise and we fall together. Being a good partner means setting a good example. We have to be honest about where we’ve failed to live up to our potential. For too long, we’ve lagged behind in governmental accountability. So, we will modernize our government, allowing us to better measure where we really are, define where we want to go, and determine how we get there. That will be one part of our larger effort to change county government to ensure that it becomes much more transparent, open, and connected. That will start with being more transparent about how taxpayer dollars are spent and what specific impacts they make. We will do all of this and so much more because government works best when our people drive the conversation. I look forward to going about this work in collaboration with the esteemed members of our County Council. We will establish a new working relationship, built on mutual trust, respect and openness in all we do. That will be the guiding philosophy behind our administration. Relationships matter. The best relationships are built on a foundation of trust and honesty. Baltimore County, I will always be honest with you. That starts today. You deserve to know that we have many challenges ahead of us. They are real. They are significant. And they will not be easily solved. But, believe this, they can be solved. In fact, we can meet and surpass the challenges ahead — both those expected and unforeseen — as long as we do it together. Under our administration, we will no longer pass an undue burden onto future generations. We will refuse to escape the responsibility of tomorrow and instead go right after our challenges. In fact, we’re already on our way. Our team has been hard at work building upon the foundation we laid over our two years of research, analysis, and conversations. I want to thank every member of our transition team, who are helping to refine and sharpen our plans for our future. Our communities too, are helping to lead the way. We launched an online portal to hear directly from the people, and we have received hundreds of ideas and recommendations from residents ready to build a better Baltimore County together. While our transition work continues, I promised to hit the ground running. Later today, I will sign an executive order to establish a blue ribbon commission to examine our budget process and make recommendations based on national best practices. In the coming days, I will direct meet with our Directors of Budget and Office of Information Technology to execute a plan to release budget information online for all residents to review and consider. And prior to my first budget, I will direct my office to work with every member of the County Council to host a cabinet in the community meeting, so that your government comes directly to you. These are just the first steps toward fulfilling the vision we laid out. There is so much to do. And I could not be more excited to get to work. Last night, just like so many other parents across our county, Marisa and I tucked our little girl into bed. As I so often do, I thought about what her future would look like. I know that the future I wish for my daughter is the same one you wish for your children and the same wish we have for all of the children within our communities. We have a responsibility to build a Baltimore County where that future we all wish for is within reach. One where our children can go to the college they want, or find a trade they’re passionate about. One where our children want to stay in or return to Baltimore County to raise families of their own. One where our children can find an affordable home in a neighborhood where they feel safe. One where our children send their kids to our public schools, confident that they will get the best education possible, regardless of ZIP code. That future is possible, and we will build it together.